Rated 4 out of 5 by PRogers from LCD Display This is my third B & D coffeemaker. My last one purchased in 2011 is still working but it's hard to pour from as spout is not a good design and spills when pouring. So, I purchased a new one and the LCD clock is not backlit so you can see it in a dark room like my old one. Other than that, it seems to be working fine and pouring is greatly improved. Rated 1 out of 5 by JDel from It doesn't last very long... I haven't even had this coffee maker for a year yet, and it stopped working. The clock and lights work, but it does not brew or heat anymore. I should have read the reviews before I bought it. Rated 4 out of 5 by Chauncy from Good buy for the money I have had mine over two years making coffee daily and it is still going strong. 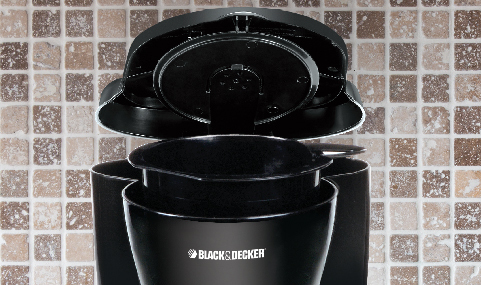 Rated 1 out of 5 by rahs from Poor design If you like to chew your coffee grounds, this maker is for you. The design of multiple holes for the water to brew through the grounds makes the filter fold over and then coffee grounds clog the "sneak a cup" feature so you get weak coffee with grounds in it. Also, you can't see the water level where it is located on the back of the reservoir. Haven't had this coffee maker for 6 months and will never buy another Black and Decker product again. Rated 2 out of 5 by Alicia J from Cheap Material We have only had this coffee maker for about 4 months - after a few weeks a piece of the lid (the part that holds the lid on) broke off. we made due with it. But just the other day the other piece broke off so we can't even pour the coffee with the lid of the pot on. Very cheap material. Rated 3 out of 5 by Dot1 from Inexpensive I bought this 1 1/2 yrs ago...worked fine till today. The lights are working but that's it. It won't brew. I tried a couple of times to brew but nothing happens. model bcm1410bc I need water to coffee grounds ratio please lost instructions. Wow. Great timing. We had been using a Keurig that was given to us a couple years ago, and it just quit. So we bought this B&amp;D just the other day. We'd forgotten the ratio we liked, so for openers, my wife put in 3 scoops for 12 cups. Well, yikes!! That was some killer bold brew! So we tried 2 scoops for 8 cups and that was pretty good. It's a work in progress, so start there and see how you like it. You can finesse from level to slightly rounded to heaping scoops until you get something that works for you. Good Luck!